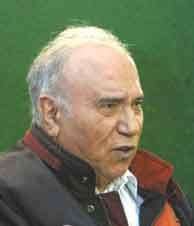 Ali Mohammad Afghani (Persian: علی محمد افغانی‎‎, born 1925 in Kermanshah, Iran) is an Iranian writer. Veteran contemporary writer, Ali Mohammad Afghani was born in 1925 in Kermanshah. He was raised in a poor family. Although a top student, he dropped out of school to work alongside his father. He failed to get employment with the National Iranian Oil Company. He then decided to continue his education. After obtaining a high school diploma, he joined the armed forces and studied at the Military Academy. During that time the country was experiencing political turmoil. He became a member of a clandestine political organization comprising army colonels. They had left-wing political inclinations and opposed the then leader of Iran Mohammad Reza Pahlavi. On August 19, 1953, the nationalist government of Mohammad Mosaddeq was overturned through a Shah-backed coup d’etat. Activities of the organization were disclosed after Zahedi swept to power, and Afghani was arrested along with a number of his colleagues. He was sentenced to life imprisonment, but he was released after five years due to a commutation. Afghani wrote his masterpiece Lady Ahou’s Husband while in prison. The novel was published in 1961. Literary figures such as the renowned translator Najaf Daryabandari and the prominent author Mohammad Ali Jamalzadeh praised his novel. The novel depicts the appalling life of Iranian women in that era. Daryabandari once stated, "Looking into the life of the rabble, the author in this book pictures a painful tragedy. The scenes described in the book are reminiscent of masterpieces written by Leo Tolstoy and Honoré de Balzac. I have never had the same opinion about any other Persian books." In March 1962, Jamalzadeh, in a letter to a friend, wrote, "I received Madam Ahou’s Husband. I think fellow writers and I should kiss goodbye writing. Iran is a bizarre country. It nurtures talented youth in no time. What a wonderful book! Such descriptive images." In 1965, Afghani published his second novel, Joyful People of Qarrasu Valley. The novel is about the love of a poor boy for the daughter of the village lord. It also depicts political currents of the post-1941 period. His other works include Woven of Grief, Sindokht, Turnip Is a Paradisal Fruit and Cousin Parvin. His forthcoming books are Fathers’ World; Children’s World and a novel on the Iran-Iraq War. ↑ "Ali Mohammad Afghani". 2006. Archived from the original on October 21, 2006. Retrieved May 23, 2009. ↑ "Ali Mohammad Afghani". 2009. Retrieved May 23, 2009.